Nikola Kalinic is a professional football player currently playing for Croatian National Team and Series A club AC Milan. He has played for some famous clubs like Blackburn Rovers and Fiorentina previously. Kalinic was also included in the 23-man squad for the FIFA World Cup but recently made highlights after being sent by the the Team manager back to home for refusing to enter the ground. 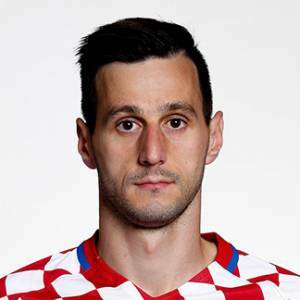 Nikola Kalinic was born to Neda Kalinic and Jozo Kalinic on 5 January 1988 (age 30). Born in Solin, SFR Yugoslavia, he currently holds Croatian nationality. He also has an older brother. named. Kalinic was a fan of AC Milan since his childhood as his brother and mother both were the Italian's supporter. Nikola Kalinic's current annual salary is reported to be €3 million with the weekly wage of €75,000. He is the joint second highest paid player in the club only behind Leonardo Bonucci who earns €110,00 a-week. He has an endorsement deal with Nike and wears the products of the company. He might pocket huge earnings as per the deal. Nikola Kalinic has a son with his wife Vanja Kalinic. The couple has been together since Nikola was 18 and got married in 2007. It has already been a decade since their marriage and the couple is living a happy married life. Native of Peljesac, Croatia, his wife is also a famous local footballer. The couple first met in Dalmatia and currently live together in Milan, Italy. He was sent back home after refusing to come on against Nigeria in the World Cup 2018. Kalinic played for the youth team of Hajduk Split and made his senior debut with the club in 2005. He remained in the club for 4 years where he scored 32 goals in 59 matches. He also played on a loan to two different clubs during that time. The Croatian striker the played for Blackburn Rovers (2009–2011) Dnipro Dnipropetrovsk (2011–2015) Fiorentina (2015-?). He currently plays for AC Milan on loan from Fiorentina.